>> Also available: Video clips and video editing, Voice over recording, Extensive photo restoration, Digitally animated signature, and Green Screen videos recordings! Encore DVD Productions believes in quality, value, and attention to detail. We do not create the typical “cookie-cutter” video slideshow. We believe every photo tells a story, and every project should be unique. 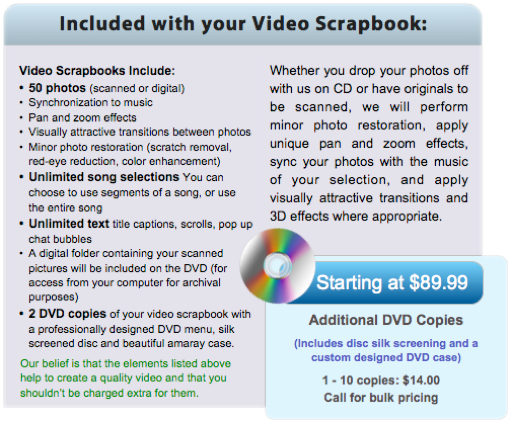 We produce a video scrapbook on DVD using your photographs, videos, memorabilia, and documents for all special occasions. We add the music you select, special effects, text titles, beautifully customized transitions, and graphics to bring your video to life.